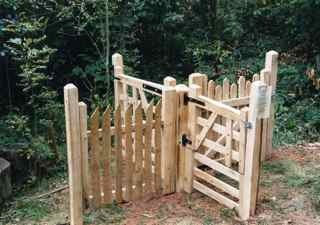 ~ To provide a safe, tranquil and pleasant environment for wildlife, work, training and leisure. All primary extraction is by horse. 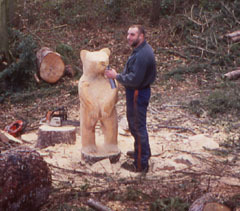 Felling and other works are undertaken by skilled local contractors led by Peter Harmer. All timber and timber products are certificated as sustainably produced by the Forestry Stewardship Council (FSC) having been independently inspected and evaluated. Value addition is sought at every stage, mobile milling and on site processing ensures minimal transportation with the production of high quality, cost competitive timber being the emphasis. ~ Sawn softwoods, Norway Spruce, Pine, Douglas Fir and Larch, either from stock or to order. Choosing suitable timber for indoor or outdoor use by species and quality allows us to avoid the need for inappropriate use of heavy metal and poison based preservatives which have become the ‘standard’ of most builders’ yards and garden centres. By offering durable and better alternatives we avoid unnecessary contamination of the ground, our environment, ourselves and the people around us. 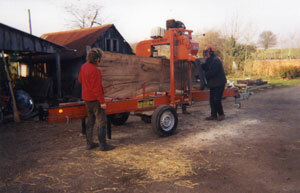 ~ We can, of course, just sell you some excellent quality timber straight from the wood. To discuss your requirements, place an order or to visit the wood to select your timber, please telephone beforehand for an appointment as we are not a retail outlet and are usually busy doing all the other jobs!